Welcome back y'all to another wonderful edition of What's On Your Workdesk? Wednesday! 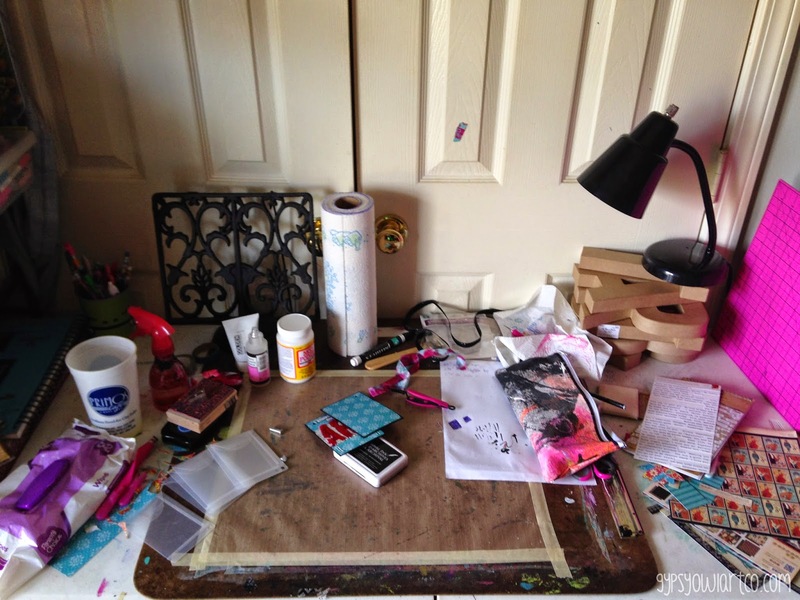 Today I have a little work in progress (a very early progress shot) and a relatively clean desk. Go figure! I seem to swing from nice and neat to Oh-My-Craft-Gods-What-Exploded-On-Your-Desk!?!?!?! 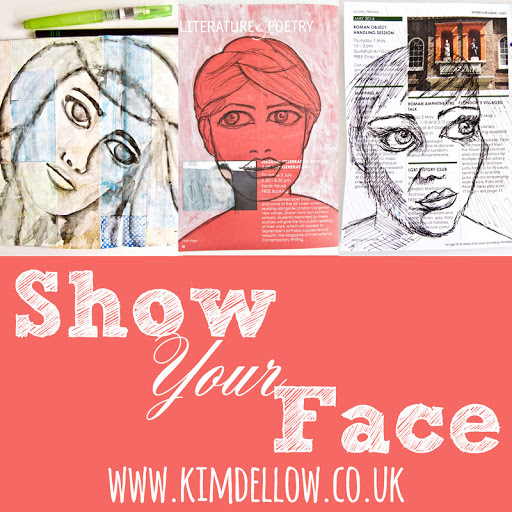 Last week was taken up by Graphic 45 projects so this week I am playing catch up on my Documented Life Project! I am a whole week behind and not sure I will catch all the way up by Saturday either. Oh well. It will give me a fabulous excuse to make a mess at work. My bosses love that! Anyway, on to the desk - you can see one of my boxes of Washi Tape. Totally not organized at all. It's way more fun to dig and find forgotten treasures. Then you can see my journal's early background stage. Yes, it's another turquoise week. And of course, my trusty brayer. Love that thing! Then we have a few tubes of paint and a couple of new wooden stamps on my lamp. A new Heidi Swapp stamp, lots of newspaper which is supposed to help me keep paint off my previous and next pages - I'm too messy. It doesn't really help. And lastly, you can see my new Dylusions Bubble stencil (9x12) I am very much digging that stencil! That's all I've got so for this week y'all. 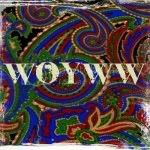 Stop over at Julia's awesome blog to find out more about WOYWW! See y'all next week!! Oh y'all didn't really think I'd leave you hanging about last week's desk now did you? 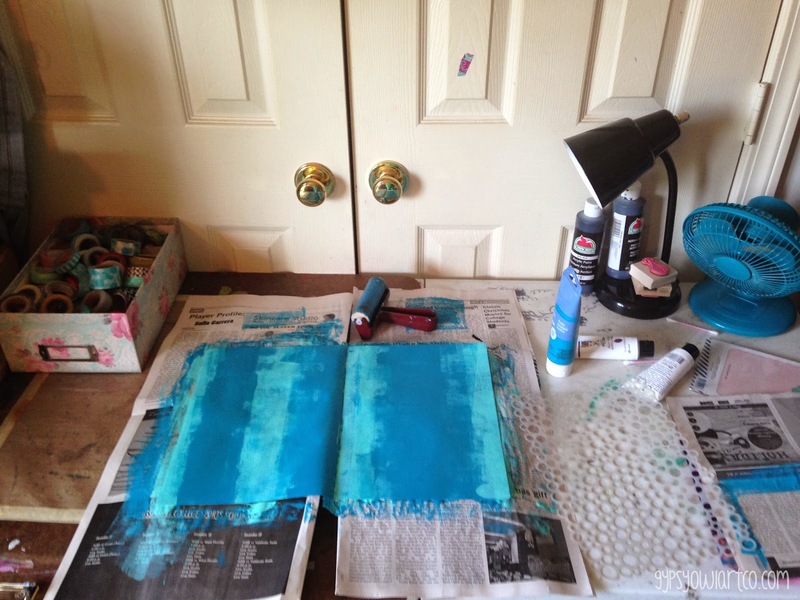 Ok, so the blue things with the red letters in the middle of my desk was for this project right here: Altered ATC Album and the papers on the right were for this project right here: Altered Box. Now, the stack of letters that my lamp is sitting on? Those were supposed to be finished for my Graphic 45 audition but between the kids and being unmotivated early in the week, procrastinating, and just being ridiculously busy I didn't get them finished. Started but not finished. So one day (hopefully soon) those will show up in a blog post! Hope y'all weren't too overwrought at my secret keeping! Turquoise yousay - well I agree, and why not - it is the most uplifting colour huh! I'm at the 'what exploded on your desk' stage currently, so you you may have the trophy for this week, your desk is looking organised! I cant tell what the letters were to spell....nosey aren't I! I might have missed it..are those cupboard doors or room dividing doors? I love the idea tha tyou may be able to fling them open and 'ta da' everyone with your artistic endeavours!